World of Motorcycling | Coverying rider culture and the motorcycling industry. Welcome to the World of Motorcycling blog covering rider culture and the motorcycling world. This blog is designed to be an extension of the World of Motorcycling weekly podcast launched on October 12th, 2017. For the latest episodes you can click on the episodes listed here or you can visit www.worldofmotorcycling.podomatic.com for all the latest episodes. If your an itines or stitcher user then look us up subscribe to weekly show. If you like what you see and hear please pass us along to all your friends. Thanks for stopping by. MILWAUKEE (July 30, 2018) – To inspire even more people around the world to experience the exhilaration of riding a motorcycle, Harley-Davidson today shared details of its “More Roads to Harley-Davidson” growth plan through 2022. Introducing a new modular 500cc to 1250cc middleweight platform of motorcycles that spans three distinct product spaces and four displacements, starting with the company’s first Adventure Touring motorcycle, the Harley-Davidson™ Pan America™ 1250, a 1250cc Custom model and a 975cc Streetfighter model, all of which are planned to launch beginning in 2020. Additional models to broaden coverage in these product spaces will follow through 2022. Leading the electric motorcycle market by launching Harley-Davidson’s first electric motorcycle, LiveWire™, in 2019 — the first in a broad, no-clutch “twist and go” portfolio of electric two-wheelers designed to establish the company as the leader in the electrification of the sport. LiveWire will be followed by additional models through 2022 to broaden the portfolio with lighter, smaller and even more accessible product options to inspire new riders with new ways to ride. New retail formats — including smaller, urban storefronts globally to expose the brand to urban populations and drive sales of the expanded Harley-Davidson product portfolio and expand international apparel distribution. Watch a video highlighting key elements of Harley-Davidson’s More Roads to Harley-Davidson plan here. The company intends that all of the matters discussed in this press release are “forward-looking statements” intended to qualify for the safe harbor from liability established by the Private Securities Litigation Reform Act of 1995. The statements in this press release are all forward-looking statements that relate to the company’s More Roads to Harley-Davidson plan, including without limitation the company’s plans, its objectives and expectations, the future financial and other results it seeks to attain, the new product introductions it contemplates, and its views of market opportunities and benefits. These forward-looking statements are subject to certain risks and uncertainties that are likely to cause actual results to differ materially, unfavorably or favorably, from those anticipated as of the date of this press release. Certain of such risks and uncertainties are described below, and others are listed in the company’s July 24, 2018 earnings press release. Shareholders, potential investors, and other readers should consider these factors in evaluating, and not place undue reliance on, the forward-looking statements. The forward-looking statements in this press release are made as of the date of this press release, and the company disclaims any obligation to update such forward-looking statements to reflect subsequent events or circumstances. This week we catch up with Dale Walksler vintage motorcycle expert and restorer, TV Personality and owner of Wheels Through Time Museum. Dale has been collecting and restoring vintage American Iron for 50 years which culminated in the Wheels Through Time Museum located in Maggie Valley, North Carolina. The museum is just a hop, skip and kick start away from Tail of the Dragon highway. Dale not only knows the history behind each of the 300 bikes he showcases but he has hosted 2 TV shows which aired on Velocity and Discovery Networks. In addition he also hosts Dales Channel a subscription based channel which houses over 500 episodes of he and his crew restoring and riding the bikes featured in his museum. Of course we cover the latest happenings within the world of motorcycling, our weekly safety tip, things seen out on the road and a whole lot more. So grab yourself a hot cup of coffee and join us or download the show and take it with you, as we bring you another great hour of the World of Motorcycling. This week we catch up with Kirk Taylor Award winning custom bike builder, TV Personality and owner of Custom Design Studios. Kirk is a passionate guy who enjoys building works of rolling art. He is the type of builder who is always seeking new opportunities to try his hand at including his latest work where he is experimenting with hubless wheel technology. Kirk’s is the type of guy who is pushing the boundaries yet is level headed enough to know what will and won’t work. You won’t want to miss this great interview. Then it’s onto Between the Lines where we cover safety, race updates, things seen out on the road and the latest trends taking place in the riding world. We end the show with our events and weekly trivia question. So grab yourself a hot cup of coffee and join us or download the show and take it with you, as we bring you another fun and informative show. This week we interview Dave Eady a long time Seattle Cossack Rider and Historian. Dave shares with us a some of the history of the stunt/drill team along with his passion for preserving Motorcycle History through his own private museum. Of course we cover Between the Lines, Things seen out on the Road and the latest trends taking place in the riding world. We end the show with our events and weekly trivia question. 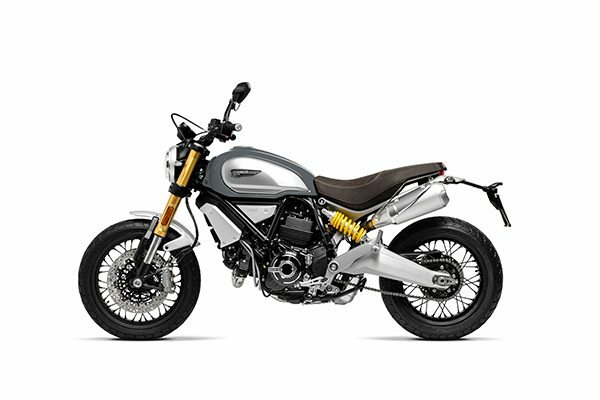 2018 Ducati Scrambler 1100 to arrive at dealerships this Spring! The much-anticipated expansion to the Scrambler Ducati family, the Scrambler 1100, will be arriving in showrooms with a celebration befitting of the Italian company’s values. On May 4 and 5, a unique “open house” event featuring live music, food trucks and the opportunity for motorcycle enthusiasts to ride the Scrambler 1100, will take place in select dealerships throughout the United States and Canada. The Scrambler 1100 amplifies the creative disposition of the Scrambler in more mature and sophisticated lines. It is the third engine recently added to Ducati’s successful Scrambler product line. A 1,079 cc oil/air-cooled L-twin engine with 86 horsepower (75 hp in City mode) offers ample power, and the motorcycle comes standard with traction control, three Riding Modes (Active, Journey, and City), Bosch Cornering ABS, and an under-seat USB socket to recharge mobile devices. Offered in three exciting variants, the Ducati Scrambler 1100 will be available as a standard, a Special or a Sport version, all with distinct design cues. Highlights on the Scrambler 1100 Special include a dedicated “Custom Grey” color with a brushed swinging arm and exclusive seat upholstery. The Sport version comes in a “Viper Black” color with contrasting yellow under panel, double-banded mudguards, and performance Öhlins suspension to amplify its sportier attitude. With Ducati’s Premier financing option the Scrambler 1100’s pricing starts as low as $148.52 per month, it satisfies the needs of the most proficient motorcyclist without compromising the fun, style and freedom Scrambler stands for. A bigger bike and an even better set of standard equipment lets riders upgrade without leaving the Scrambler family. 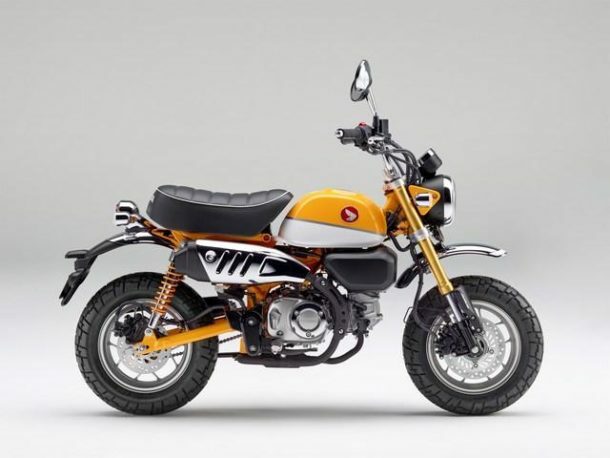 Honda’s iconic mini-bike is re-imagined for the present day, with styling that draws heavily on the original, complemented by modern, premium touches such as USD forks, twin rear shocks, LCD instruments, IMU-based ABS and full LED lighting. Its 125cc air-cooled engine delivers 6.9kW power, and fuel efficiency of 67km/litre; wet weight is a mere 107kg. However, it hasn’t yet been released where and when the revived Monkeys will be available, and what the MSRP will be. The Honda Monkey bike is perhaps most widely known as a groovy icon of the 1970s, but it first saw the light of day in 1961. Originally developed as a 49cc child’s plaything for Tama Tech, an amusement park in Tokyo, it proved so popular that a road-going version was developed, which was initially exported to America and Europe in 1963, with a distinctive chrome tank, folding handlebars and 5-inch diameter rigidly-mounted wheels. For more of this story visit http://www.powersportsbusiness.com. Indian Motorcycle today announced the three finalists for The Wrench: Scout Bobber Build Off, a custom motorcycle competition that spotlights amateurs who build bikes purely for the love of turning a wrench. A judging panel of professional builders and experts, including Roland Sands, Satya Kraus, Jason Paul Michaels and Hot Bike Editor-in-Chief, Jordan Mastagni along with an online fan vote, selected Alfredo Juarez, PJ Grakauskas and Christian Newman as the top three entrants. The three selected finalists will face off in a custom-build battle for a grand prize of $10,000 and a feature spread in Hot Bike Magazine. From March 15-30, hopefuls from across the nation entered for the chance to win a new 2018 Indian Scout Bobber and a budget of $10,000 to design and customize the stock bike. From over 100 submissions, 12 top designs were showcased online and available for fan voting until April 19. Juarez, Grakauskas, and Newman, who received the three highest vote counts, each come from distinctly unique backgrounds and offer concepts that are as equally diverse. Newman, a mechanical engineer of mining equipment from upstate New York, is an incredibly creative amateur builder who shook up the chopper scene with his recent build of a 1940 V-twin fabricated almost entirely out of stainless steel. Newman will be building a swingarm-chopper-style Scout Bobber with old-school custom components, including a Crazy Frank fender and raw metal fabrication. Newman uses many old-world techniques which are more painstaking than most modern methods but require a more intensive attention to detail and higher level of craftsmanship. “I’m excited to take a modern Indian motorcycle and infuse it with an 80’s chopper aesthetic,” said Newman. “I love that Indian is doing a 180 with this contest and shining a light on the guys that build for nothing more than the love of creating something totally personal and totally unique”. Grakauskas is a family man from Ohio working as a safety inspector for OSHA, but it’s inside the shed in his backyard where his real passions are fed. With several polished and refined café racers under his belt, the Scout Bobber will be a totally unique platform for Grakauskas, but one he has been dreaming of building for quite a while. Inspired by his love for road racing, Grakauskas is building a full-fairing café racer with race-inspired brakes and suspension, as well as taking additional measures to increase the stock engine’s output. Grakauskas’ drawing looked good, but he promises it’ll be nothing compared to the finished product. Juarez is a NASA engineer based in Las Cruces, N.M. He started wrenching at the age of 12, but his fabrication journey began in college, building bikes and hot rods for his friends, and making all of the tools and tables he needed to do the job right. Spending his work days building things like flammability testing chambers makes the complex designs and ideas he submitted seem simple to him. When developing his concept for the competition, he visited an Indian Motorcycle dealership with an engineer’s scale and was able to glean all the necessary measurements to design his draft perfectly to scale—including his proposed rake, trail wheelbase and seat height within his entry. While his design concept is incredibly ambitious within the short timeline, Juarez has built frames in a matter of weeks and is confident he’ll can produce an incredible rigid Scout Bobber on deadline. The three custom Scout Bobbers will be unveiled on August 5th at the Buffalo Chip during the historic Sturgis Motorcycle Rally. The public unveil will trigger a second fan voting process, which will determine the grand prize winner. The winner will be announced two weeks later and will receive a $10,000 grand prize along with a feature spread in Hot Bike magazine. We kick off the show with the latest from Inside the Helmet where we do a ride by overview of what’s happening in the world of motorcycling. This week we start things out with MAG’s new CEO, Ducati adding more Advanced Rider assistance Systems to their upcoming bikes, a couple of new Electric bike makers coming on the scene and more. Then it’s onto Behind the Bars where we cover the latest trends in the motorcycling world. This week we chat about Flat Tracking and Moto GP along with the lawsuit between Klock Werks and Dragon Fly Concepts, a fatal accident that could have been avoided and BMW using 3D printing to produce more parts for its bikes. John, Steve and Walt discuss this week’s safety issue. Oh and don’t forget the weekly trivia question.